I have produced a charity calendar where I am photographed in twelve situations these will fulfilled some of my dreams but also show what is possible when you have those dreams regardless of any disabilities. My life has been full and I have achieved a lot but I’ve had a lifetime ambition to be a model, this is my chance! 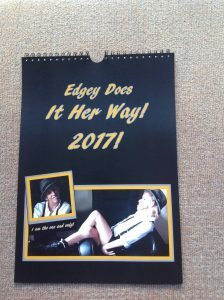 All proceeds raised from the “Edgey Does Her Way 2017” calendar have gone to Fountaindale School and the Chesterfield Football Club Community Trust. Fountaindale is a Specialist SEN school situated in Mansfield that offers inclusive education for pupils aged 3 to 19, who have complex physical and sensory needs. The aim of the school is to provide a stimulating, challenging, caring environment, which allows each child to develop their full potential educationally, physically, socially and personally. They strive to develop their children towards being valuable and valued members of the community. They also support the parents of disabled children at schools across Nottinghamshire where disabled children attend providing services which give access to quality resources and expertise. The Trust is the independent charity for the football club. Its vision is “To work in partnership with our communities to develop a wide range of opportunities which improve the quality of life and outlook for individuals, groups and neighbourhoods in Chesterfield and the surrounding area.” One priority is sports participation for both abled bodied children and those with disabilities. Living the Life of Zoe Edge – Blog 3 – “Zoe’s Song!!! I JUST WANNA BE ME! !” →← Oh what a night!